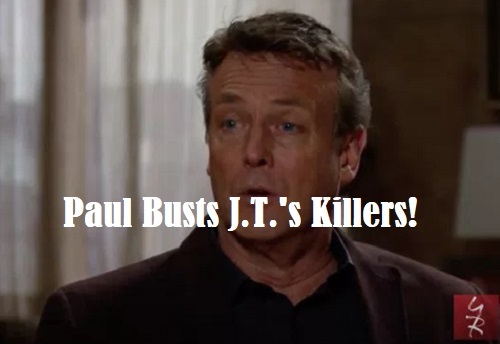 The Young and the Restless (Y&R) spoilers tease that Paul (Doug Davidson) will face some tough decisions down the road. He’s partially to blame for this whole mess with J.T. (Thad Luckinbell). Paul took a guy that was already coming unhinged and added to the pressure. He fed right into J.T.’s anger issues and put him on a dark path. Of course, J.T.’s the one who abused Victoria (Amelia Heinle) and tried to kill Victor (Eric Braeden). We obviously have to hold him responsible for the choices he made. Still, Paul isn’t completely innocent. He didn’t commit those violent acts, but he should’ve been more aware of what was going on. Paul let a Victor (Eric Braeden) vendetta get in the way of Victoria’s safety. All of that could be important as this storyline moves forward. After J.T. (Thad Luckinbell) is declared dead by the partygoers, they’ll dig a hole and toss J.T.’s body in it. They’ll lie to Paul and try to avoid any trouble. Nikki (Melody Thomas Scott), Sharon (Sharon Case), Phyllis (Gina Tognoni) and Victoria will vow to bury the secret right along with J.T. They won’t want Paul to get a whiff of the truth. However, it’s tough to believe these ladies can actually get away with this. Consider all the recent secret spillage. Phyllis ended up blabbing after she found out about Christian’s (Jude and Ozzy McGuigen) paternity. Nick (Joshua Morrow) also caught Nikki (Melody Thomas Scott) hooking up with Arturo (Jason Canela), so she’s not great at hiding things either. Mariah (Camryn Grimes) saw right through Sharon’s attempt to ignite Nick’s jealousy. She’ll be asking questions and developing suspicions before you know it. Victoria hid her abuse pretty well, but she can’t carry the whole group here. They’re just not secret-keeping pros! Paul isn’t the best at his job, but he’ll be especially determined thanks to his role in the turmoil. He arguably pushed J.T. to his breaking point, so he’ll resolve to track him down and make an arrest. Between the blood from the crime scene and Victor’s new statement, The Young and the Restless spoilers say Paul will have a slam-dunk case. However, Paul won’t have a chance to put J.T. behind bars. The abusive attempted murder will already be worm food! How will Paul react when he ultimately finds out the real story? Will he sweep it under the rug since he’s somewhat to blame and J.T. was such a monster? That might be a fitting end to this Y&R storyline. The cover-up will be the ladies’ only crime, so Paul may just let it slide. After all, Victoria’s been through enough as it is. Making her suffer even more seems awfully cruel. Nikki is also Dylan’s (Steve Burton) mother, so Paul may take pity on her. He would’ve done the same thing if someone had gone after their son. Maybe Paul will prove he has a heart by ignoring what he’s learned. The Young and the Restless spoilers say fans won’t want to miss what’s ahead. We’ll give you updates as other Y&R news comes in. Stay tuned to the CBS soap and don’t forget to check CDL often for the latest Young and the Restless spoilers, updates and news.